Kalaignar Karunanidhi paid special attention to translating the ideology of Periyar into reality, and his own contribution to the cause of uplift of the backward classes in Tamil Nadu is historic and indelible. My association with Kalaignar began at Periyar gurukulam, Erode. We have moved together for 73 years, wedded to the same ideology, our brotherhood growing every day in spite of occasional differences in approach when the exchange of ideas got precedence over the exchange of pleasantries, as we were both involved in the war against oppression. 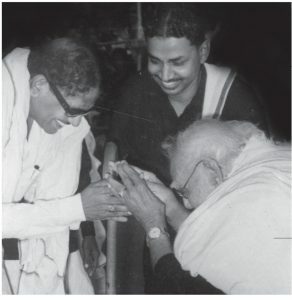 Anna began to implement the principles of Periyar during his short span of almost one-and-a-half years as Chief Minister. Anna legalized the concept of Self Respect Marriages advocated by Periyar, devoid of priests and rituals, through an exclusive enactment. This Act recognized not only prospective self-respect marriages but also marriages held in the past with retrospective effect. Two other prominent achievements of Anna as Chief Minister were naming the Madras State as Tamil Nadu and establishing the two-language educational policy in the State. On the social justice front, a principled decision was taken during Anna’s rule to form a Commission to uplift the Backward Classes in the State. In the meantime, Anna passed away owing to chronic illness. The goal of dispensation of social justice is possible only through reservation in education and public employment, giving adequate representation to the Scheduled Castes, the Scheduled Tribes and other Backward Classes. Dispensation of social justice continues to be the core principle of the Dravidian Movement, founded by South Indian Liberal Federation (SILF), popularly known as the Justice Party. In 1928, the Communal G.O. (government order) came to be implemented by the independent ministry which had the support of the Justice Party. From then onwards, the proportion of representation of the under privileged has been rising towards adequacy. Periyar quit the Congress in 1925 on the issue of social justice and founded the Self-Respect Movement and later, the DK. Periyar’s wishes were translated into action continuously by Kalaignar. When he became the Chief Minister After Anna’s demise in 1969, reservation both in education and employment in Tamil Nadu State stood at 25 per cent for the Backward Classes (B.Cs), 16 per cent for the Scheduled Castes (S.Cs) and the Scheduled Tribes (S.Ts), which was implemented during the regime of K. Kamaraj as Chief Minister. The first Backward Class Commission was appointed by the DMK’s Chief Minister under the Chairmanship of A.N. Sattanathan in 1969. The Commission submitted its report recommending adequate representation for the oppressed sections in the society. Taking cognizance of an obiter dictum, (passing reference) of the Supreme Court judgment in the Balaji case, which said the total reservation was not to exceed 50 per cent, Kalaignar raised the level of reservation for BCs from 25 per cent to 31 per cent and for the S.Cs and STs from 16 per cent to 18 per cent in 1971. During the DMK rule (1971 – 1976), Kalaignar formed a separate Ministry for the Welfare of the Backward Classes, the first of its kind in India. During the regime of M.G.Ramachandran as All India Anna Dravida Munnetra Kazhagam’s Chief Minister in 1979, the State government issued a G.O. superimposing the economic criterion of a ceiling of an annual income of Rs.9,000/-, making B.C. families above this limit ineligible to avail themselves of reservation benefits. Both the DK and the DMK along with allied political parties, opposed the economic criterion. 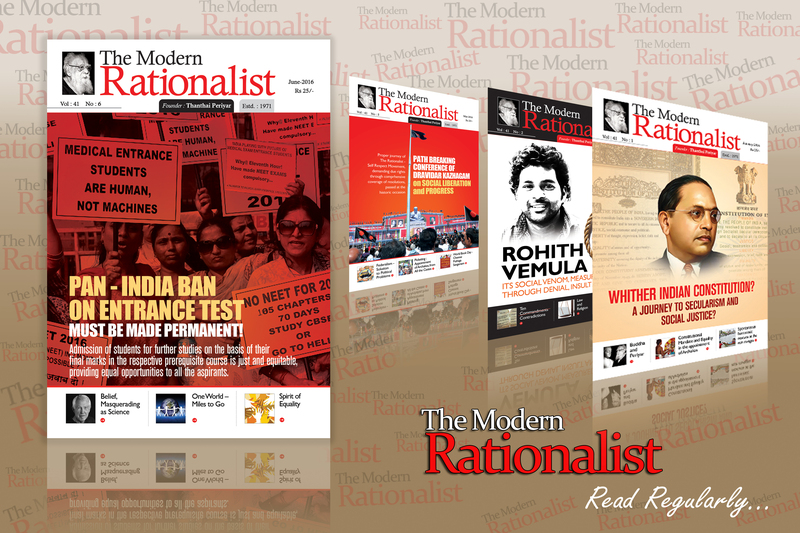 The Indian Constitution also recognizes only the social and educational planks for reckoning ‘backwardness’. Adopting the economic criterion was against the provisions of the Constitution. Continuous agitations and propaganda were undertaken by the DK, the DMK and the allies for about a year, explaining why the income limit was uncalled for and unjust. The DK organized protest meetings and took out processions throughout Tamil Nadu. Copies of the G.O were burnt in public and the ashes were sent to the state authorities. The DK, the DMK and other allies explained to the people that M.G.R’s government had upset the major plank of social justice. The electorate proved it by giving a mandate against MGR’s action in the immediately held parliamentary elections in 1980. A leader as popular as MGR lost all the parliamentary seats his party contested, except two. MGR realized that the central nerve of Tamil Nadu had been against his party on the issuance of the circular prescribing economic criterion to identify the backwardness of the under privileged. After the debacle in the parliamentary election, he convened an all-party meeting where, on behalf of the DK, I had the opportunity of pointing out the elasticity of the economic criterion and how it could not be the reckoning factor in identifying backwardness. Afterwards, MGR withdrew the circular that his Government had issued on economic criterion. Further, MGR raised the total reservation for the B.Cs from 31 per cent to 50 per cent, along with the already existing reservation of 18 per cent for the S.Cs and the S.Ts. In a society comprising people with graded inequalities, resulting from birth-based discrimination, the compensatory measure, that is, reservation system to such a divided people cannot bring about equality all of a sudden. Those who desire reservation cannot access and avail themselves of the reservation benefits equally. It is correct to state that even among the beneficiaries of the compensatory measures, there should be a segregation so that unavailing and under-availing sections can benefit in a better and easier way. To attain this, compartmentalization of the reservation within BCs and SCs is required. New reservation within the reservation has to be carried out. During his Chief Ministership (1989 – 1991), Kalaignar divided the total 50 per cent reservation meant for the Backward Classes into the categories of Backward Classes (BC) and Most Backward Classes (MBC) and allotted 30 per cent and 20 per cent reservation for them respectively. Later in Kalaignar’s regime (2006 -2011), 3.5 per cent was reserved newly for the BCs among Muslims, minimizing the 30 per cent reservation to 26.5 per cent for the rest of the BCs. During the same tenure, Kalaignar brought the provision of a new reservation of 3 per cent for Arundhathiyar, who are in the lower rung among the SCs, out of the total reservation of 18 per cent meant for the SCs. Owing to the new reservation measures brought by Kalaignar, among the down trodden sections of BCs and SCs, many people who had either not availed themselves of reservation or those who had lesser share of reservation were able to get the desired share. The new quota among the SCs has enabled people from the Arundhathiyar community, who were traditionally carrying out scavenging work, to become doctors and teachers of higher academic institutions and enter other fields for the first time. Earlier, Only State-level reservation had been implemented for the Backward Classes in education and employment. To uplift the conditions of BCs, the All India Backward Classes Commission was formed with B.P. Mandal as its head in 1977 during the regime of Janata Party at the Centre. The Mandal Commission submitted its report in 1980. From then onwards, there were continuous demands to place the recommendations of Mandal Commission in Parliament. During the Congress regime, it was placed and all the parties in the Parliament unanimously resolved to implement it. The DK conducted 42 conferences and 16 agitations throughout Tamil Nadu and other States and at New Delhi for the cause of the BCs. The DMK, as co-fighter insisted on the Central government’s implementation of the recommendations of Mandal Commission. In 1990, when V.P. Singh became Prime Minister, the sustained struggles for the implementation of Mandal Commission recommendations saw the light of day. The backward classes of the entire country became entitled for 27 per cent reservation in Central Government employment. V.P. Singh gave representation to the DMK in his Cabinet by including Murasoli Maran as Minister. Both the DK and the DMK were at forefront of the struggle for the cause of uplift of backward classes for more than a decade, which made the Centre to provide reservation at all-India level. While implementing reservation for the BCs in the Central Services, the ‘creamy layer’ concept was introduced to exclude certain categories in the BCs itself. But Kalaignar was stubborn in opposing the concept of creamy layer and maintained that creamy layer had no relevance in respect of BC & MBC reservations in education and employment in Tamil Nadu. Kalaignar achieved the goal of social Justice in yet another dimension. He enabled the elevation of the then District Judge A. Varadarajan in Tamil Nadu as the Judge of the Madras High Court. This elevation, which made Varadarajan the first High Court Judge having from the SCs in the Country, was a silent revolution. This initiative of Kalaignar’s further enabled Justice A. Varadarajan to become the first SC Judge of the Supreme Court. In respect of apex court too, Kalaignar’s contribution remains significant on social Justice front. When Kalaignar was in power for the third time (1989 – 1991), the combined reservation of 18 per cent for the SCs and STs was enhanced to 19 per cent with one per cent exclusively for the STs on the direction of the Madras High Court. The total of 69 per cent reservation was protected through the legislation of the enactment in 1994 under Article 31(C) which was later inserted into the Ninth Schedule of the Constitution through the 76th Amendment with due assent of the President of India. The idea of an exclusive enactment was suggested by DK, which was implemented by the then Chief Minister J. Jayalalitha. The specialty of the insertion of the Act in Ninth Schedule provides immunity for the Act from the judicial scrutiny. Such an enactment of social justice was the first of its kind in all of India. When reservation in education and employment are demanded by certain communities in Maharashtra, Gujarat, Haryana, Rajasthan, Telangana and Andhra Pradesh, the respective State Governments quote the ‘Tamil Nadu Model’ to exceed the total reservation of 50 per cent. The core axis of Tamil Nadu revolves around social justice; any deed of deviation or detraction has proved as fatal debacle to the rulers. Kalaignar paid special attention to translating Periyar’s ideologies while he was in the government as well as in the opposition. The core of Periyar’s philosophy is to bring about equality through equal opportunities in a society rife with birth-based discrimination. Periyar strengthened the reservation mode as a compensation for the birth-based inequities. In that way, reservation has to be implemented as a mode of compensatory discrimination. Having created equality substantially, though not fully, in many areas of education and employment, Periyar found discrimination against the non-Brahmins in appointing archakars (priests) in the temples functioning under the administrative control of the Hindu Religious and Charitable Endowment (HR&CE) Department. Only Brahmins, that too on hereditary basis, became archakars in those temples. Periyar wanted to launch an agitation in 1969 itself demanding the appointment of people hailing from all castes as archakars by entering the sanctum sanctorum of temples. Periyar obliged. As promised, Kalaignar introduced a Bill in the Legislative Assembly for the appointment of archakars hailing from all castes in temples, which was passed and became Act in 1970. In the column of ‘Object and Reasons’ of the Bill, it was stated that the Bill was brought as per the recommendation of the Committee on Untouchability, Economic and Educational Development of the Scheduled Castes under the Chairmanship of L. Elayaperumal, formed by the Government of India in 1969 when Indira Gandhi was the Prime Minister. The Act was challenged in court on the ground that it interfered with religious affairs. It was a challenge born out of the fear that atheists might also be appointed. Ultimately, the Supreme Court held that the Act abolishing the hereditary rights in the appointment of archakars in temples was valid. Aspirant archakars from various castes had to be well versed in the performance of worship and connected rituals. So appointments could not be made immediately. In ‘Viduthalai’, the official organ of the DK, we wrote an editorial titled, ‘Operation Success, but Patient Died’. In 1973, Periyar passed away. As Chief Minister, Kalaignar ensured that Periyar was laid to rest with full State honours. At his funeral, Kalaignar stated that even though State Respect was paid to Periyar, he had not been able to translate his dreams of appointing archakars hailing from all castes into reality. It remained a thorn in Periyar’s heart. During the period of MGR’s Chief Ministership, a commission was appointed under the chairmanship of Justice S. Maharajan. Its report said that the agamas (sacred traditional doctrines) do not prohibit appointment of archakars irrespective of the caste identity. When Kalaignar became Chief Minister again in 2006, an enactment was brought enabling the appointment of archakars duly trained in the Vedas and the Agamas. Archakars from different castes, including Brahmins, duly trained in Government-run Archakars Training Centres were about to be appointed. Again, the Act was challenged by the Madurai Meenakshi temple’s Association of Priests. When the case was pending, the Supreme Court gave a direction to the State Government not to appoint the trained archakars. Meanwhile J. Jayalalitha became Chief Minister in 2011. In December 2015, the Supreme Court gave a verdict which did not prohibit the appointment of the duly trained archakars. But the State Government did not act on it. In April 2016, the DK launched an agitation picketing the HR&CE offices in Chennai and other districts. Nearly 1000 black-shirt cadre were arrested along with cadre from like-minded organisations. It was only in February 2018 that a non Brahmin archakar, duly trained at the government centre, was appointed at the Ayyappan Temple, Tallakulam, Madurai by the HR&CE Department. The Dravidian Movement was ideologically committed to equality and equal opportunities in the sanctum sanctorum, for all castes. The movement for this started by Periyar in 1969 achieved its goal when Kalaignar passed two exclusive enactments in 1971 and 2006. The provisions of the Act became reality in February 2018. The message of the first appointment of a non Brahmin as archakar was conveyed to Kalaignar while he was admitted to hospital. Kalaignar’s contribution in this achievement is indelible in the history of struggle for equality and equal opportunities to all castes in all spheres, including the appointment of archakars in temples. When Kalaignar became Chief Minister for a second tenure in 1971, the debates and discussions held in Legislative Assembly were thought- provoking, with ideological narratives. The leader of the opposition, Dr.H.V.Hande, criticized the DMK Government, calling it a ‘third rate government’. When the members from the treasury side were furious and were about to protest, Kalaignar asked them to remain calm, and replied, “The honourable member from the opposition mentioned our government as a third-rate one. I would like to say, in fact, I’m proud to say that our government is not third-rate government but a ‘fourth rate government’. Yes, fourth in the hierarchy of the varnasrama dharma viz. sudra. Our government is the government of sudras, by the sudras and for the sudras.” The opposition was tongue tied. 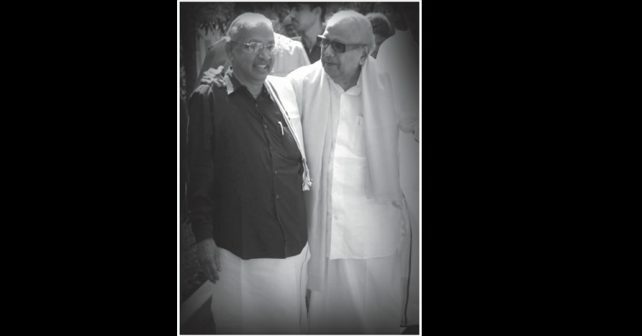 The statement made by Kalaignar with presence of mind, which bore the stamp of his ideology, reflects his unique style of interactive functioning. Periyar was happy and proud when he learned of this statement made by his disciple, Kalaignar at the floor of the State Legislative Assembly. All these go to prove that Kalaignar, as he himself claimed,was a Manamigu Suyamariyathaikkaran, meaning ‘Person of Self Respect’ first and last. As a Chief Minister, he was always interested in preserving the dignity of the lowest of the low in the social hierarchy and ran a ‘fourth rate government’, as he himself claimed. At the all India level, as far as permitted by the Constitution, he held the flag of the State aloft, upholding its rights. Kalaignar has acknowledged that he hailed from a socially backward, extremely oppressed community, with no claim to any honour. Economically, too, he belonged to a family with no affluence. He always remembered all this, which acted as the motivating force for all his initiatives through his career, as a politician, a man of letters and a valiant fighter for social justice.